Welcome to the services section of our website, below is a list of all the services that we offer with detailed descriptions of everything that gets done with each service. We are able to provide these services to all businesses small to medium size. 24/7 On-Site Support - We will come to your office and repair, maintain, and fix any problems that you might be having with your desktops, notebooks, printers, networks, or servers. We have the experience to manager your servers, perform regular updates and repair any issues that you are having. Phone Support - If you have a simple question that you would like to try to solve over the phone, you may give us a call anytime and we will try to solve your problem over the phone. Remote Support - Remote support is used when you are having an issue with a workstation or something important that needs to be looked into immediately, we can actually login to your computer remotely and find the issue and resolve the problem without you having to wait for us to come out to your office. Custom Web Development - We have been developing, and maintaining websites since 2003. We have hundreds of designs to choose from that will best fit with your company's industry. We know many programming languages, therefore we can better develop your website to suit all your needs, whether you want to have customers fill in a contact us form and have it e-mailed to you, or add a full shopping cart based system with a individual account for each customers with the ability to track, cancel, review, and place orders without you having to do anything. You will basically get a e-mail containing all that information. Custom Web Based Applications - We develop custom applications that will help you increase sales, manage your customers, employees, expenses, and income. Our applications are web based, therefore your graphic user interface will be very simple to use and very self explanatory for people who are computer illiterate. We can also create a live tour to help you train your employees on how to use your new management system. CAT-5, and Coax Wiring - Moving into a new office? Or do you need to add additional outlets? We can rewire your entire office if you are moving an existing wiring closet to a different part of the building, we can wire a new office if just started and are looking for someone to setup your building, we have experience currently in running CAT-5e straight, and crossover, and we can also run your Coax cables. Network Administration - If you currently have a network up and running are you are looking for someone to manager all your workstations, servers, and maintain your machines to ensure everything is running smoothly, we can do that for you. We have a lot of experience in the network administration field, we can install a firewall for you to prevent unauthorized access to your network, content filters so that you can specify what you want your employees to have the ability to access on the web, we can also setup Virtual Private Network (VPN) so that your employees can login remotely from their home or wherever there is an internet connection so that they can grab a file that they need when they're in a meeting or looking a number for a customers, their whole desktop will be in front of them. 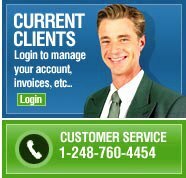 If you have any questions or need more information about our services please don't hesitate to call me at (248) 760-4454. And any other city that's in the Metro-Detroit area, if you are unsure if we service your area call us at (248) 760-4454.
Review all services performed and see a detailed description about what was done. Track all invoices billed and see what still needs to be paid for. Schedule a service call and track how many locations are ahead of you. Request quotes and manage current projects that we are currently performing for you along with detailed descriptions of what has been done since the last update.